Shooter looks at the steps to immersion in a game. The visitor enters the chamber and is surrounded by the ambient sounds of a gaming archade. In the center a mirrored cube emits laser beams which weave a web throughout the space. Upon tripping a laser visitors find themselves incorporated into the game, experiencing what it feels like to be the target. As with any game you always lose. Shooter is an interactive immersive installation piece. The work is comprised of a room aprroximately 15 feet by 15 feet by 10 feet tall. Eight louspeakers are mounted in the eight corners of the room. The loudspeakers create a three dimensional sound space. In the center mounted on a pipe pedestal is a one foot square mirrored cube that emits red laser beams. A smoke machine fills the room with occasional puffs of smoke which make the lasers visible. The lasers refract on mirrors positioned around the room creating a web of lasers. 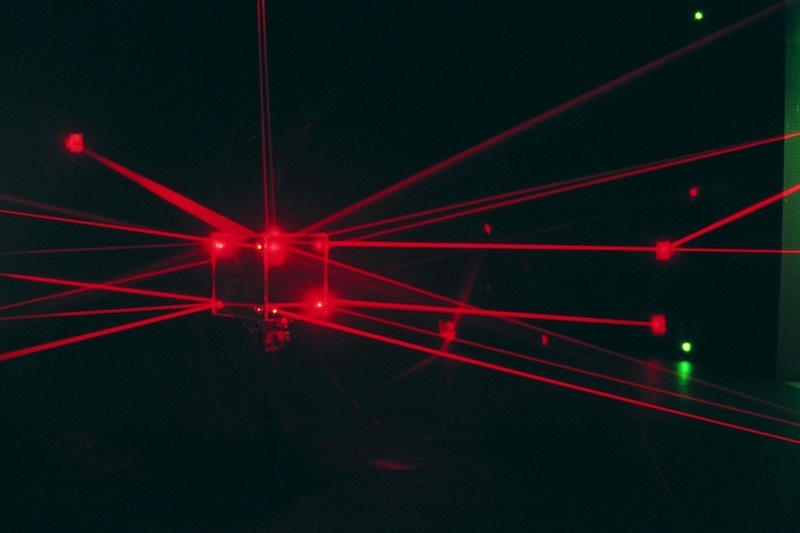 The sound space is triggered when a person passes through one of the lasers. Menacing dogs, machine gun fire,xenophobic rants, video gaming sounds etc. create the sensation of being immersed in a video game.